Snow storm slowed my progress on the WWII British P.O.W. dollhouse. But I did "finish" the left front-opening panel (I say "finish" because I still want to go back and touch up small spots, but overall its done). over the original green paint with red paint. Mullions werre missing from windows above. then (mostly) sanded off too. paper - so those were removed. Left Panel "Finished": Green is on! brought it in to us. Left Side of the house: Mullions have been created for all the windows! 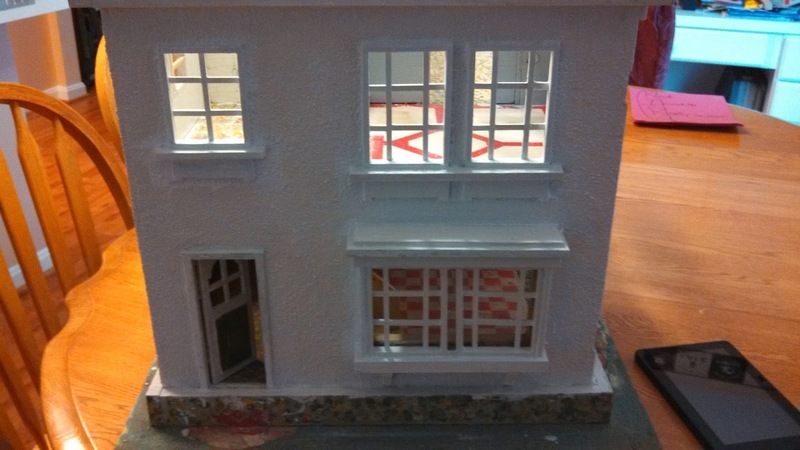 (I still have to give the house body another coat of white and paint the trims green). In searching on the internet, I did discover a reference to a WWII German POW in a Gainesville, TX P.O.W. 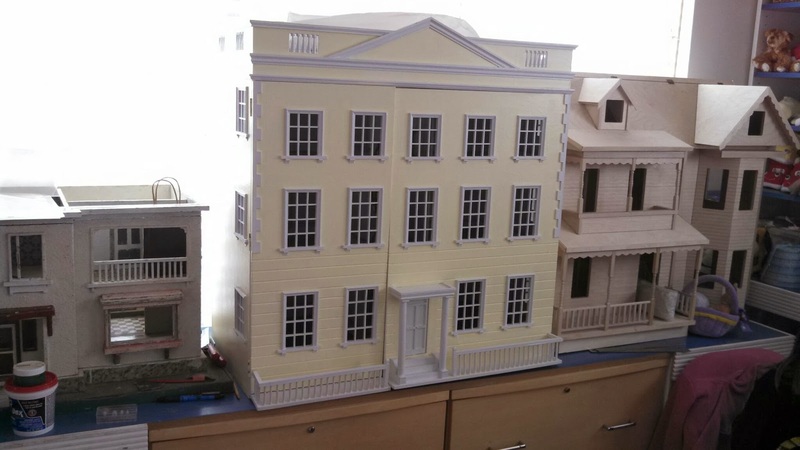 facility that built furniture (crib) and dollhouses! I was completely stunned by this as I was unawares that there were WWII German POWs on USA soil during the war! I have learned something new. 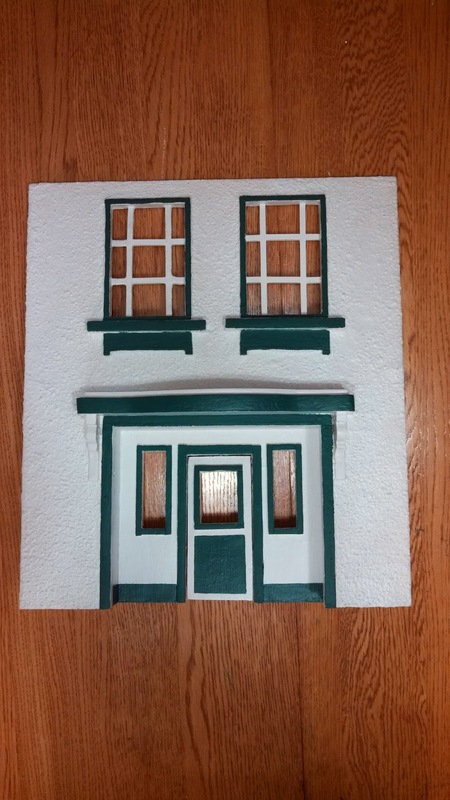 I still have to create more mullions for the other 2 sides of the house, paint the trims all green and fix up the "yard" a bit. And then the customer has added some minor interior work to be done. So it will still be another week or two of work. But that is the current status of the WWII British POW house! Customer brought me her "WWII British P.O.W. dollhouse". I was intrigued by this description and have searched for information about these houses, but have come up empty. 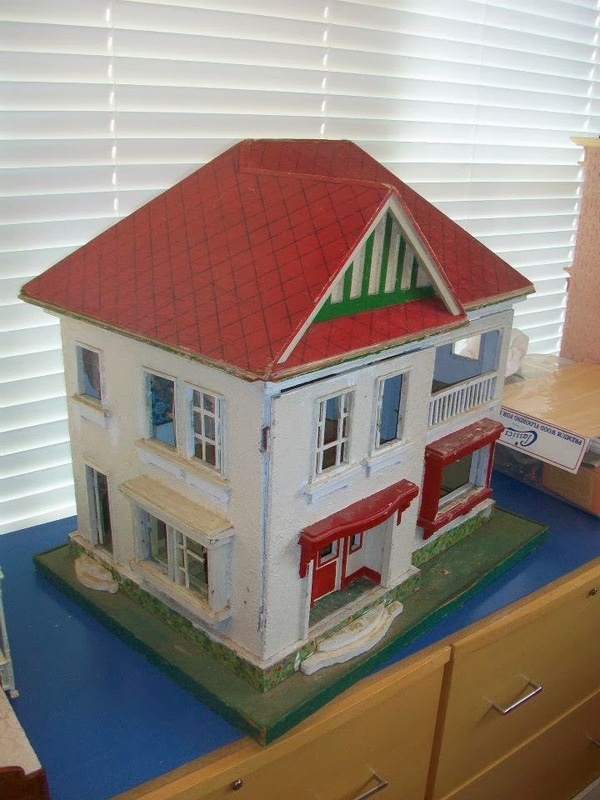 Customer recalls that her mother bought the house for her when she was child (maybe 5 or 7?). A British P.O.W. 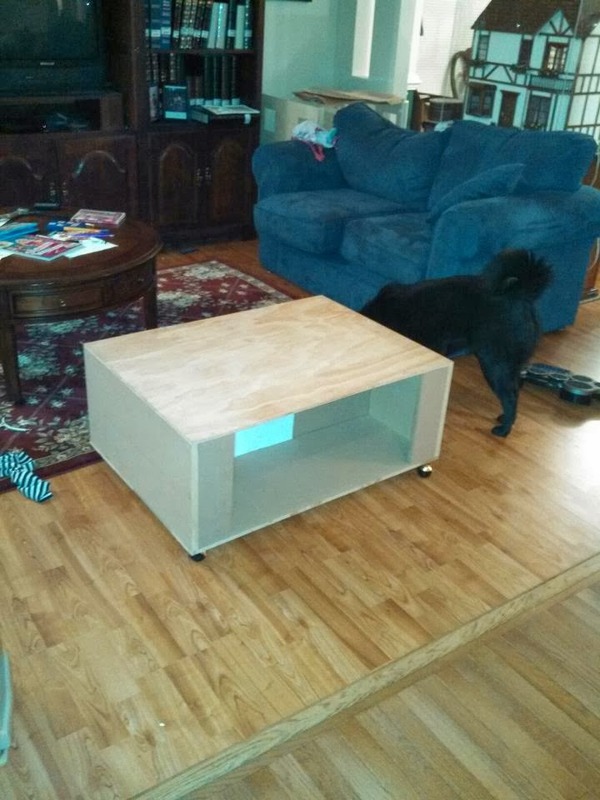 built the house: but she is unsure if the P.O.W. was an Italian or Germany POW in a British camp or a British soldier in a camp. 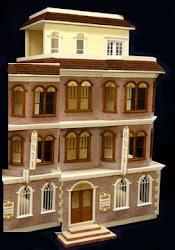 Either way, it is a mystery how this dollhouse came to be sold to the customer here in the USA. The customer does not want me to touch the removeable roof. But she would like me to restore the house back to it's original green trim paint colors (which she painted white and red when she was a child) and to repair/replace the missing mullions in the windows. I will repaint the exterior white and spruce up the "yard". 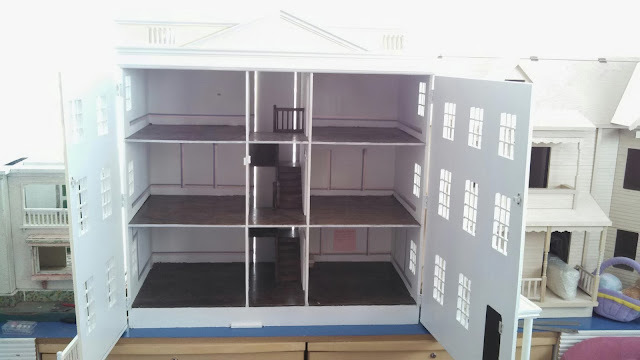 With the roof removed, you can look down into the top floor's 4 rooms. The front doors swing open to reveal 4 rooms. With the front opening doors and a removable roof, it will be easy to clean these interior rooms. The bottom floor's back two rooms however are inaccessible and will be difficult to work on. Customer wants me to clean the rooms, install real wood floors in the rooms she put down faux wood drawer liner papers and install wallpaper on the top floor's back room. The oldest house we have renovated as of this point was a 1947 "The Birches" house by the Keystone Company (Keystone's "The Birches"). 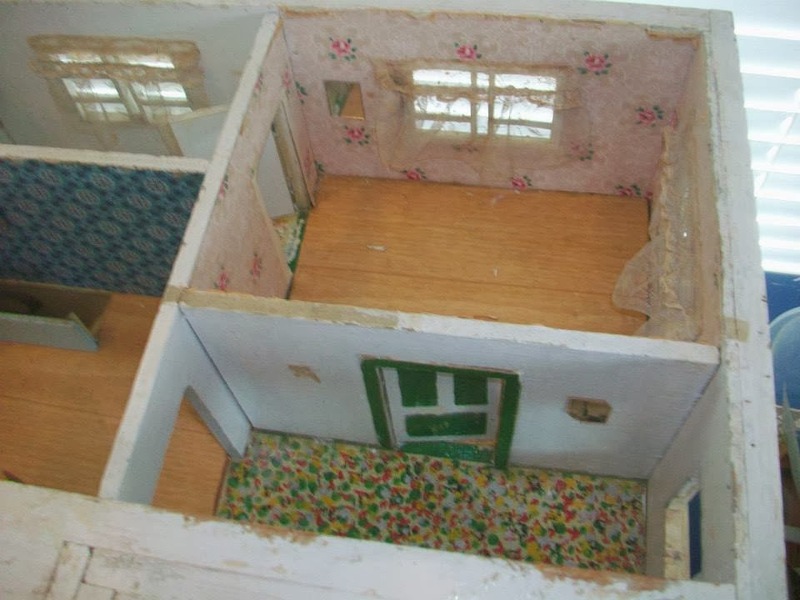 Now, if this dollhouse really was created during WWII by a P.O.W., this house would be tied or possibly even the oldest dollhouse on which we have worked. If any of you have ever heard of a WWII P.O.W. 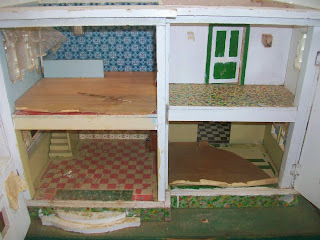 dollhouse, I would love to hear more about these dollhouses! Even with temperatures dropping to 0 and below with wind chills into the -20s, customers are still braving the elements to bring me fun things on which to play. Er, I mean, fun things on which to WORK! 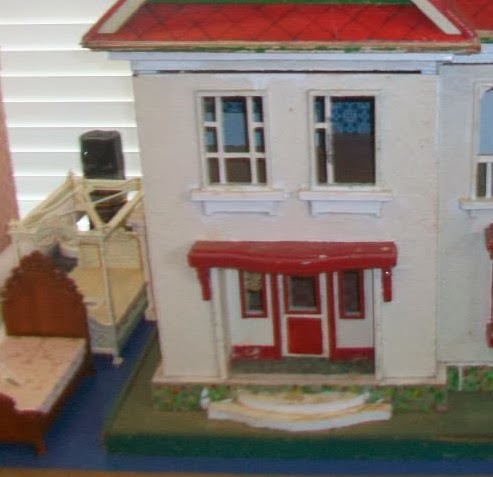 I cannot find which Honeychurch dollhouse this is but having worked on that manufacturer's doll houses before, I know this is one of theirs. Customer has asked me to wallpaper the interior. I decided I'm no good with guilt, and I felt very guilty at how infrequently I posted on my blog. But it was only about my Mansion, and I don't get to work on my Mansion often, so therefore I didn't post often. But I was am still very involved in miniatures and working on things! Just not my Mansion. 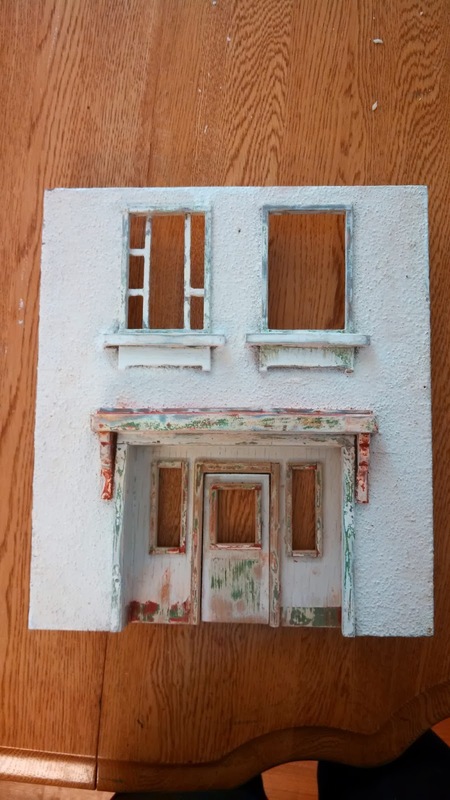 So I have changed this blog ("My Miniature Mansion") to be about ALL my miniature works (including the projects I work on for my job at a miniature store)! The faint line on the wood above the stairs is where the steps must go to, so I have to add a stair or two to the bottom -- which will also help it clear the doorway opening that is under it too (see top photo). In the past year, my Dad also built me a base: The base in the photo below is for under the main house (another one is being made for under the addition part of the house). Yes, it is just as large, if not larger than, my coffee table and longer than my dog (who I think is trying to chew on it already!) Luckily Dad put it on caster wheels so I can roll it around cuz it's gonna be huge! The open space will be divided into kitchen and staff rooms! I'm glad to be back - and now I can tell you about all the projects I have in process and not just this one that I dream about . . . .